22-Nov-2016 -- At least once a year I spend time on Australia’s Gold Coast, visiting relatives. I have already visited all of the Degree Confluence Points near the Gold Coast, but today got the opportunity to visit this point, a little farther away. I was driving north from the Gold Coast to Hervey Bay (in preparation for taking a tour of Fraser Island the next day). I decided to make a short detour to the north to visit this point, which is just east of the Bruce Highway, near the town of Gin Gin. This point had been visited once before - 15 years ago, in October 2001. The description from the previous visitors was a bit puzzling, because it suggested that they had found the point difficult to reach. Satellite imagery, however, clearly shows the point to be in a field, just 300 m south of a paved road (Ellerays Road). So that’s the route that I took. The point was easy to reach: Just a short walk down a farm path, then just a short distance across a sugar cane field (where the plants - at this time - were fortunately no more than knee high. 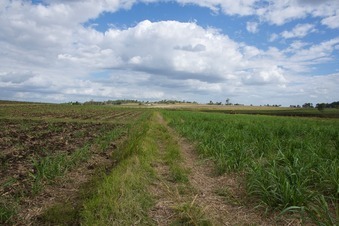 The point itself lies in the gap between two separate sugar cane fields. After visiting the point, I visited the nearby 'Mystery Craters’ - a bit of a ‘tourist trap’, but perhaps worth checking out if you happen to be in the area.